IT'S OFFICIAL: The length of reality TV show finales is now ridiculous. 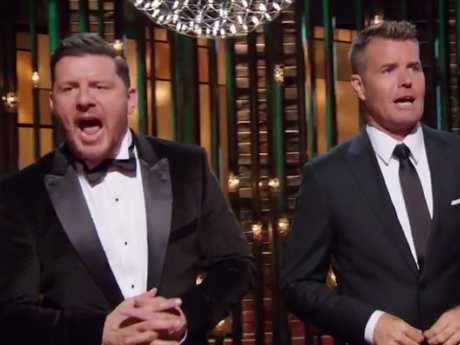 At close to two and a half hours - considered by most as too long even for a feature film - the MKR finale has joined the trend of dragging viewers slowly towards a result over half a night. The finalists, family teams Amy & Tyson and Valerie & Courtney, are required to cook five courses - FIVE - in an exhausting degustation. We can only imagine how long it took to actually shoot the finale if this is the edited-down version, especially if like last year, two endings were filmed in order to keep the real winners a secret. Imagine having to put food on a hundred plates and then having to pretend to win. It's enough to put you off your chutney. Valerie and Courtney, cunningly relabelled as 'Team 2' at the judges' table so nobody can guess who's cooking all the Indian food, start with a samosa crisp with chat, or "like a little Indian pizza" according to ex-contestant Demi. Remember her? She was a contestant in Group 3, roughly nine thousand years ago. Amy and Tyson make parmesan truffle mousse with mushrooms, which Demi fails to call "heaps fancy cheese". 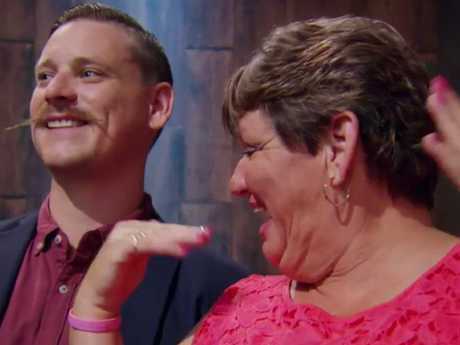 The finalists are watched and cheered by ex-contestants and family members - a little distracting, but worth it for Amy and Tyson's brother's moustache. By the time the judges sit down to eat, we've been told this is the grand final and reminded of the prize money nine times. We get it, it's fine. It's also mentioned more than once that food in the grand final should be good and have flavour in it, which is extremely helpful information. Sure, we understand the need for retrospective trawls through each team's journey' (ugh) - it builds drama and sets the scene. If you can imagine anything more tense and dramatic than a pea soup battle, you're crazy. Valerie and Courtney make a pea and coriander soup with salmon, while Amy and Tyson serve a pea and ham soup complete with crackling and crispy back fat, which was my nickname in high school. Please note, Amy: it is very important to enunciate the phrase "pork hock" very clearly so we don't think you're just insulting Tyson. Without having to watch it every time, let's just take it as a given that after a quick pep-talk, Amy and Tyson will high-five and Valerie and Courtney will hug before and after every single course. Let's take it as read that Manu will aggressively shout that there's one minute left every single time there's one minute left. And let's agree that Valerie's husband Errol is just a little bit fond of being on camera. Let's agree and move on. As far as the food goes, it's fair to say that I want all of it in my face immediately. This is some very, very good cooking. For the fishy course, Valerie and Courtney's Spanish mackerel with we-learned-new-words molee sauce and khichdi goes up against Amy and Tyson's buttery marron with Jerusalem artichoke and some very tart rhubarb, which was also my nickname in high school. We learn how to poach seafood, squish finger-limes, and ignore Josh - all in all a valuable tutorial. By this point, Valerie's husband is no doubt negotiating to have the show renamed as "Errol And Also Some Cooking", so when Valerie invites him to the kitchen stage to taste her sauce, he practically has to be dragged off with a hook. Dude. This is about your missus, not you. I'm sure Valerie and Courtney's pork vindaloo is incredible, but there's no doubt about it: Amy and Tyson OWN the main course. They serve veal, bone marrow and sweetbreads, explaining that sweetbreads are gelatinous, chewy animal glands with a removable membrane, proof that the Sweetbreads Marketing Board really has its work cut out for it. 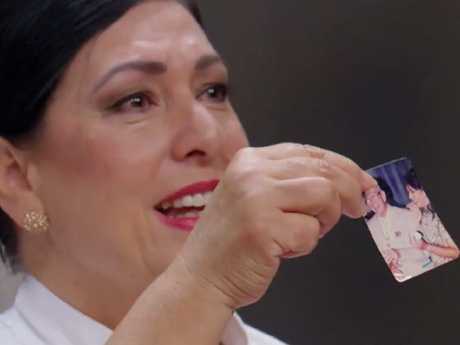 Still, when mains are served to the judges, Karen Martini makes a massive, greasy-chinned call and calls it "the best dish for me, hands down, in eight years". WOAH. The way to the judges' hearts is apparently just scraping the butcher shop floor and adding a sauce. This is truly the gland final. There's no delicate way to put this: if you're in a reality TV show and one of your relatives has died, the producers are going to milk that like the only cow in the dairy. Valerie's late father Poppy is the source of most of her and Courtney's recipes and definitely deserves considerable mention, but come ON. They show a photo of Poppy. They kiss a photo of Poppy. They're certain that Poppy is watching MKR right now in heaven's rec room. They hold a tearful family conference about Poppy. Poppy's recipe for this segment has just one instruction: lay it on thick. WAKE UP YOU GUYS WE'RE ALMOST THERE, THEY'RE PUTTING SUGAR ON THINGS. There's a pistachio kulfi snazzed up with berries and gold leaf on one side, and a chocolate cremeux fancied up with mint sorbet and crystallised mint leaves on the other side, whatever those words mean. It's all very clever and delicious-looking and the judges are in raptures, but by now if you served angel tears with a Tom Hardy garnish we'd still be a bit over it. 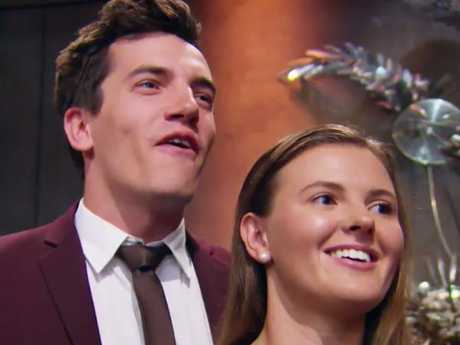 Do we really need slow-motion footage of the contestants walking into the kitchen? It's MIDNIGHT. We're TIRED. Tell us who WON. Oh god. Just when we thought we were almost there, we realise we have to sit through the pre-announcement verdicts, voice-overs and violins. We've fulfilled our quota of the word 'journey' well into the next decade, but sure, throw a few more onto this slow-burning fire. The glitter-cannon technician's finger twitches on the trigger. People in loungerooms across the nation nudge each other awake. Of course it is. Now go get some sleep.